Transient, reversible blockade of complex I during early reperfusion after ischemia limits cardiac injury. We studied the cardioprotection of high dose of metformin in cultured cells and mouse hearts via the novel mechanism of acute downregulation of complex I. The effect of high dose of metformin on complex I activity was studied in isolated heart mitochondria and cultured H9c2 cells. Protection with metformin was evaluated in H9c2 cells at reoxygenation and at early reperfusion in isolated perfused mouse hearts and in vivo regional ischemia reperfusion. Acute, high-dose metformin treatment inhibited complex I in ischemia-damaged mitochondria and in H9c2 cells following hypoxia. Accompanying the complex I modulation, high-dose metformin at reoxygenation decreased death in H9c2 cells. Acute treatment with high-dose metformin at the end of ischemia reduced infarct size following ischemia reperfusion in vitro and in vivo, including in the AMP kinase-dead mouse. 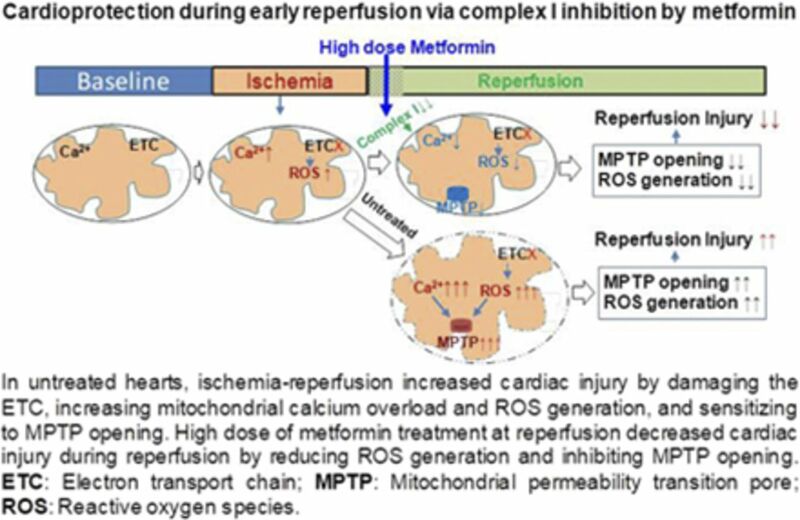 Metformin treatment during early reperfusion improved mitochondrial calcium retention capacity, indicating decreased permeability transition pore (MPTP) opening. Acute, high-dose metformin therapy decreased cardiac injury through inhibition of complex I accompanied by attenuation of MPTP opening. Moreover, in contrast to chronic metformin treatment, protection by acute, high-dose metformin is independent of AMP-activated protein kinase activation. Thus, a single, high-dose metformin treatment at reperfusion reduces cardiac injury via modulation of complex I. ↵1 A.A.M. and Q.C. contributed equally to this work. This work was supported by the Office of Research and Development, Medical Research Service Merit Review Award (2IO1BX001355-01A2), Department of Veterans Affairs (E.J.L. ); National Institutes of Health [Grants R21AG054975-01 (Q.C. ), R01GM124108 (J.L. ), and R01AG049835 (J.L. )]; American Diabetes Association 1-17-IBS-296 (J.L. ); and Pauley Heart Center, Virginia Commonwealth University (Q.C., E.J.L.). A portion of this work was previously presented as meeting abstracts in the following: Mohsin A, Chen Q, Quan N, Maceyka M, Samidurai A, Thompson J, Hu Y, Li J, and Lesnefsky EJ (2016) Cardioprotection during early reperfusion via complex I inhibition by metformin. Circulation Abstract M1123. Mohsin AA, Maceyka M, and Lesnefsky EJ (2018) Modulation of electron transport by metformin in cardiac protection: role of complex I. Society for Heart and Vascular Metabolism Sixteenth Annual Scientific Sessions; 2018 October; Charleston, SC.